Wood End Primary School pupils have been put on the ‘write’ path by the Tamworth Co-op. The school has received £786 to spend on cross curriculum creative writing projects.Head of School Mrs Carolyn Hadley said the cash will help fire the children’s enthusiasm for writing by funding events such as author visits. Budding Year One authors join class teacher Julie Price, admin officer Jillian Jackson and Emma Horsham, manager of the Tamworth Co-op’s Wood End convenience store, in celebrating the school’s windfall. The money for the school was raised by shoppers at the Tamworth Co-op convenience store in Wood End donating the dividends they have earned on their purchases. “The amount raised came as a very pleasant shock,” said Mrs Hadley. The money came from the Tamworth Co-op’s Community Dividend Fund which hands out more than £11,000 for community causes every year. “For such a small community to raise this amount of money is fantastic,” added Mrs Hadley. It will help the children to develop their writing skills. 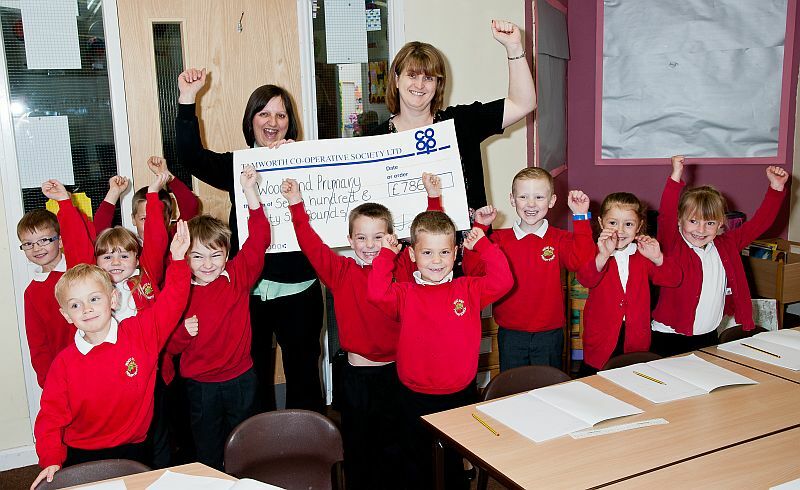 Emma Horsham, manager of the Wood End convenience store, presented the cheque to the school. “Not only will the money be used for educational purposes, but the children will have fun at the same time,” she said.